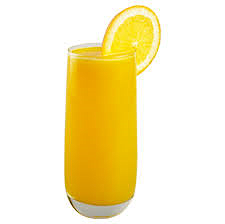 Created from just two ingredients: Orange juice and Vodka. This is a thirst quenching yet powerful Cocktail. There are many variations and adaptations of this simple 1950's yet famous Cocktail one could have to bring it bang-up-to-date and to be on-trend. Purists drink it as-is. 1. Pour all ingredients into a Hi-ball or Colins glass over ice. 2. Garnish with a slice of orange. Around 1/3rd of all Cocktails ordered in the USA use Vodka as the base. Americans love Vodka! Screwdriver got is name, so the story goes, during the 1950's some American oil workers in the 'dry' Persian Gulf smuggled-in some bottles of Vodka and discreetly added a measure or two to their orange juice while working. Not having a Mixologist's bar spoon or any spoon come to that, they grabbed the nearest implement that had to hand - a screwdriver. Over the years the name has stuck. We personally do not recommend this type of tool for mixing your drinks, Bar spoons tend to be healthier and a tad more efficient!